On our site we have a wide variety of syrup dispensers. There are different sizes, styles, colors, and materials are available to you. I’ve brought in a small selection of dispensers, to show you what’s available, so you can make the right choice for your restaurant. 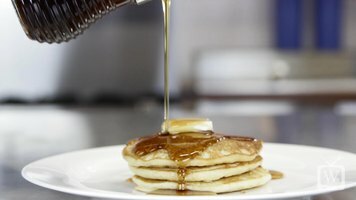 Let’s start with sizes: we currently have syrup dispensers that go from 6 ounces all the way to 14oz. What size you choose is going to depend on factors like table and plate size, menu, how busy your restaurant is, and how much you want to avoid refilling. If pancakes and waffles are your signature dish and you turn a lot of tables, consider going with a bigger dispenser. However, on a small table for two with large breakfast platters, this big dispenser might get in the way. It may be tempting to go big to avoid refilling, but having to refill these is a good way to ensure they get cleaned, and a clean top will promote easy and drip-free dispensing. Next let’s talk about materials. We have dispensers in glass, polycarbonate, and polyethylene. Glass is the most popular, as it is very clear, very scratch resistant, and just gives a higher-end feel. However, glass does break and is heavier, so if you serve kids, the elderly, or the post-bar crowd, you may want to choose a plastic dispenser. Polycarbonate looks great…just like glass, and is virtually unbreakable and very lightweight. However, it can scratch and cloud fairly easily. Polyethylene isn’t as clear as polycarbonate, but also won’t show the scratches quite as much. Both glass and plastic syrup dispenser jars are dishwasher safe for easy cleaning. But please note that the tops are hand wash only. As far as tops, you have alloy tops, which look great, but can corrode, you have chrome plated plastic or ABS (which is a very sturdy plastic) which are more corrosion resistant, but still have that classic metal look. We also have plastic tops in various colors, which is perfect, especially if you need a color code system for serving multiple syrup flavors or if you're trying to match a color in your décor. 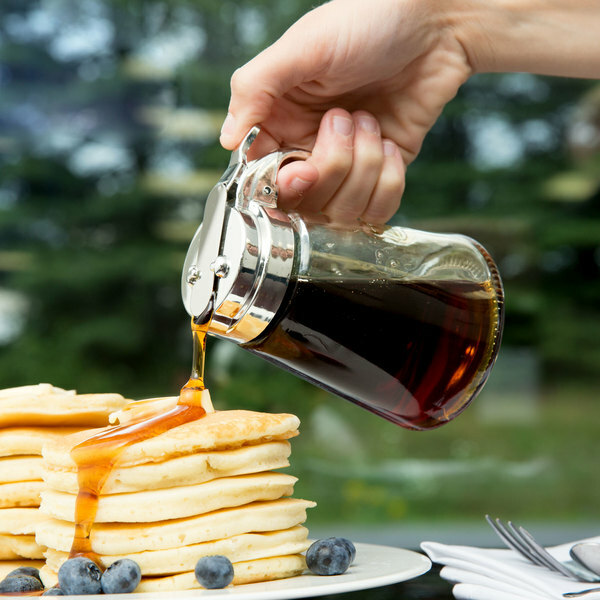 As far as style, we have, as you can see here, everything from a beehive design to sleek modern looks to choose from, so you are sure to find a syrup dispenser that suits your taste. As far as using these dispensers, the two most important things you can do is to keep the tops clean and also have back up dispensers in your stock room. Since tops get lost, dispensers can break, and sometimes are pilfered, it is always a great idea to have back up. We makes it easy to do this, thanks to our bulk price discounts! Thank you for watching! Please contact us if you have any questions! We carry 6 oz. to 14 oz. syrup dispensers made out of a variety of different materials. Check out this video to learn the pros and cons of each type and to make sure that you choose the right kind for your business! This classically designed Anchor Hocking Oneida 90077 8 oz. 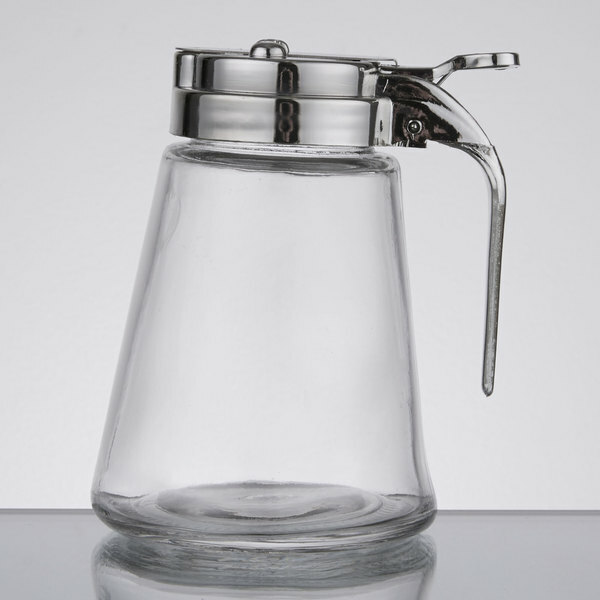 glass syrup pourer adds an essential dash of elegance to breakfast service at your trendy restaurant, buffet, or hotel. 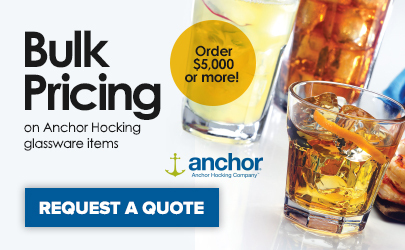 Each durable, easy-to-clean glass pourer features a chrome-plated ABS plastic top with easy pour spout, combining style and usability suitable for any decor. The lid is junk I don't recommend this iteam the glass is ok the lid don't stay on the top I keep sliping so I order the plastic to try to see if I better. These pourers are a great product for the price. We use them once a week for Sunday brunch in our restaurant and they are perfect for that. These syrup pourers are average quality. The chrome tarnish comes off easily, especially if you put them in the dishwasher. The plastic coverings for the dispenser part also cracks and breaks off after a 2 months of usage. This is a fantastic syrup dispenser. It has a very nice and even pour with an easy lever to open and it is very easy to clean. Very nice quality and just what we were looking for at a great price. We have looked else where and they were more expensive. Very good customer service . These syrup dispensers have been wonderful, they eliminate waste, look stylish and are easy to clean. They are a great value and a must for a busy breakfast room.